* Note: I’m watching the dubs from the Astro Boy Ultra Collector’s Edition sets released by Right Stuf in 2006. 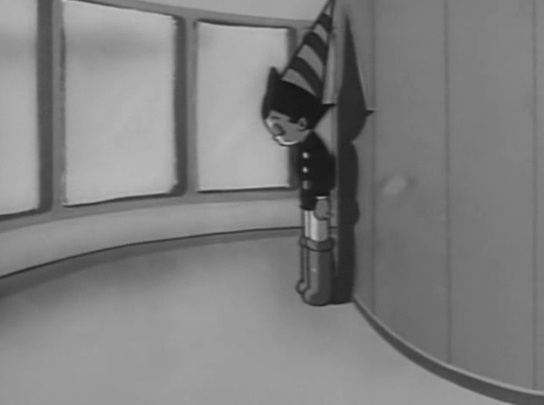 This week puts Astro Boy’s sister, Uran (Astro Girl in the dub), into the mix with odd results. Neither episode is very good — “Uran” is partly recycled from the show’s very first episode—but they do introduce gender and societal expectations into our survey of the show, something that’s been missing so far. To that end, Astro takes his sister around town (with the comical assistance of Higeoyaji) to show her the sights and teach her a little bit about the world. They end up at a robot fighting stadium, and Uran shows off her strength (she’s as strong as Astro) by jumping into the ring and winning (similar to Astro’s fights in the circus, though no one mentions this, of course). Astro pushes against her desire to continue fighting and defend her championship because little girls shouldn’t do such violent things. So, remember kids: Boys can go adventuring and fighting, but girls should stay home. By a stroke of deranged fortune however, a mad scientist, Dr. Xcess (Professor Two-Two) is at the robot arena and says that he split Uran into two full robots, essentially duplicating her. And so, after another successful bout, Uran sneaks off the lab and has the procedure done (for a bit of action, Astro fights off Xcess’s dual dog Sandwich while he tries to located Uran). The duplicating process is one of those instances of deranged visuals as Uran splits in and then the missing halves of her form from glowy mixtures and thus two Urans are created: One to fight in the tournaments, and one to be the dutiful sister and little girl. “Robot School” is a bit of a missed opportunity for me, as I really like the premise of it: To teach both Astro and Uran about the beauty of the world, be it flowers or fireworks, Ochanomizu enrolls them in robot school. It’s a neat idea, and again feeds back into this concern about becoming human; Astro even shakes Ochanomizu, pleading with him about becoming a “real boy” in the dub. But the follow-through on the idea isn’t exactly as I would’ve hoped. 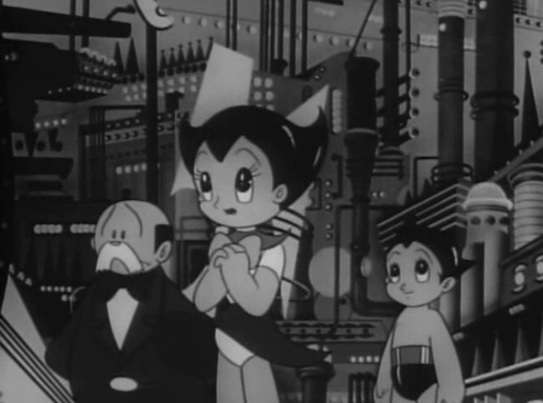 Once at school, Astro and Uran meet a weird array of other robot children, including Lara (Lala in the dub), who inadvertently sprays the robot principal with with some oil or gas from her chest. Astro takes the blame, putting the adventuring robot on notice on the first day. Once in class, it’s time for a lesson about art and beauty, so the teacher, Miss Vina (Lisa in the dub) escorts the class outside to look for flowers or such things that may be considered beautiful. Uran and Lara, however, end up in the park and get abducted by Al Mechanical. And here’s were my frustration with the episode seeps in. Al Mechanical doesn’t see beauty either. He’s concerned with function over form, and is melting down statues to turn into something more useful. It’s a nice extension of the inability to see beauty that Astro and Uran experience: They just see the world differently from others, while Al Mechanical is actively trying to destroy beauty. But this dynamic is never fully fleshed out, and instead Al Mechanical abducts Uran, Lara, and Vina to melt them down. Luckily, Lara manages to escape and return to the school to let Astro know about the danger. Of course, if Uran was allowed to fight, she could’ve saved everyone, now couldn’t she? But Astro’s in no position to help as the principal has held him for detention and made him wear the dunce cap. Which, while completely adorable, demonstrates the other big lesson of this episode: Obeying authority even when that authority is clearly not making the best decisions. The principal comes to his senses though, and Astro goes and saves everyone. And while the principal mentions a lesson about the beauty of forgiveness (Vina asks Astro not to harm Al Mechanical), it’s not exactly where the episode started, and doesn’t come full circle in a satisfying way, or any mention of what Astro and Uran learning to appreciate beauty more.